The first appearance of a Nancy Drew book on a television show was November 24th 1965, Lost in Space Season 1 Episode 11, Wish Upon a Star I never watched this show even in reruns, so this was all new to me. Lost in Space is about a family who are selected to travel to a planet in the Alpha Centauri system to establish a colony for an overpopulated Earth. However, there is an evil Doctor who tries to sabotage their mission and he becomes trapped on their spaceship, the Jupiter 2. The ship and all on board are now "Lost in Space" and the show is basically about their fight for survival and their attempts to find a way home. The family consists of Professor John Robinson, his wife Maureen and their three children, Judy, Penny and Will. Major Don West is the pilot of the Jupiter 2 and Doctor Zachary Smith is the evil agent for an enemy government who is the bad guy on the show. In Episode 11, Wish Upon a Star, Dr. Smith's carelessness causes a serious accident and Professor Robinson wishes that they were rid of him. Smith leaves the group and with Will's assistance, makes a home in the wreck of an alien spaceship. In it, they find a small alien machine that makes wishes come true. 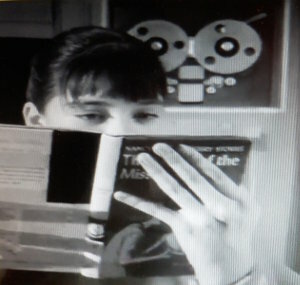 In the first half of the episode, Penny Robinson is briefly seen reading a book, with her hand covering the front cover, white tape covering the spine and black tape covering the image on the back. The book is the 1965 picture cover edition of The Quest of the Missing Map. While watching the episode on YouTube, I was able to clearly see the book starting at 33:09 and the final view of the book is at 34:39 at the bottom of the screen and you can see the title as Penny's hand is no longer covering it. Many thanks go to David Farah for pointing out this historic Nancy Drew milestone in the 12th Printing of the Farah's Guide.